I wasn’t writing here on this blog about my work, except my first day at new work. I would like to dedicate one blog post just for the company and fantastic people who are working there. At first, I should mention, which company it was, because I didn’t mention it on this blog yet. I was working in a small company named wega Informatik AG in the city center of Basel. If you want to know, what they are doing, you can read it on their website. Originally I should work as a Java developer the whole internship, but after some time, their customer stopped my project. I had to adapt to different work, but it wasn’t bad – I had the opportunity to learn some new programming languages and other skills or “touch” expensive enterprise hardware, which I will never have at home. But I don’t want to write about work responsibilities now – it would be boring for blog and you can find it in my curriculum vitae. I will write about people – about colleagues. When I came to wega, I didn’t know, what I should expect. I was used to work on full-time in the Czech Republic, but I didn’t know, how I will be able to work abroad – especially if I don’t speak German. Overall, it was without problem. Everyone was very friendly and helpful if I didn’t know something and most of all, I felt like a regular employee. From my colleagues, I’ve got a lot of tips to see in Switzerland or in Basel, they tough me differences between Hochdeutsch and Schwiizertüütsch or they were just talking about Switzerland. I really enjoyed various social events, where we had plenty of time to talk about “everything” including their normal lives. I also learned to ski! I never skied in my life and I think, if there wasn’t wega Winterausflug, I would never try it without them. When I was leaving wega, I wanted to say goodbye in a nicer way, so we picked a time after work to meet. I was expecting only a few people – mostly the ones, who I was talking regularly. Well, I couldn’t be more wrong! 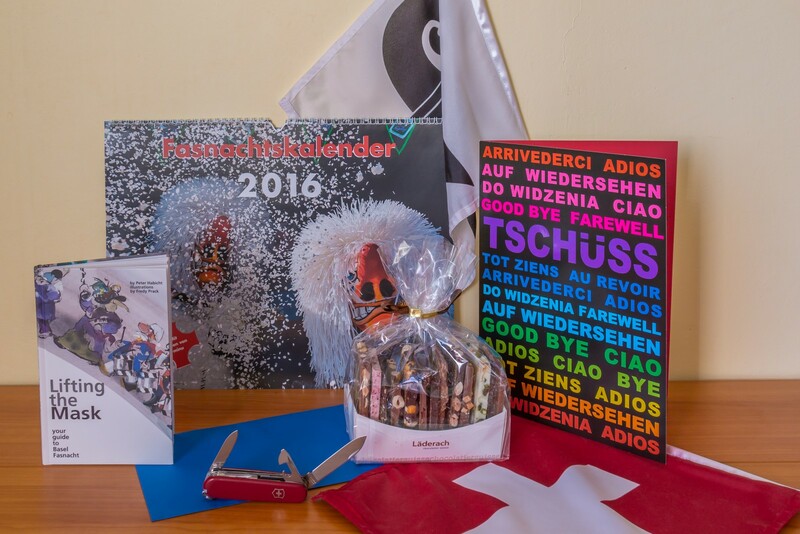 I’ve got a card with signatures, Swiss knife, calendar and book about Fasnacht, handmade Läderach chocolates and really fantastic goodbye from everyone! Thank you so much, my dearest wega.